Every year during MIT’s Independent Activities Period in January MIT students can apply for externships at alumni’s places of business. Externships last from one to four weeks. Over 300 undergraduate and graduate students participate each year. As part of the program, MIT also helps students find housing with alumni who live near the businesses sponsoring the externship. Externships are a great opportunity to learn about different types of career opportunities. Students apply in September and go through a competitive selection process run by the MIT Externship office. This year Princeton Satellite Systems had two externs, Tingxao (Charlotte) Sun, a sophomore in Aeronautics and Astronautics and Eric Hinterman, a first year graduate student in Aeronautics and Astronautics. Eric started January 9th and Charlotte on the 16th after spending time on the west coast visiting aerospace companies as part of an MIT Aeronautics and Astronautics trip. Eric took a break during the externship to attend a meeting at JPL on an MIT project. Both externs worked on our Direct Fusion Drive research program to develop a space nuclear fusion propulsion system. An artist’s conception is shown below. This project is currently funded by NASA under a NIAC grant. Eric worked primarily on the Brayton cycle heat recovery system that turns waste energy from bremsstrahlung radiation, synchrotron radiation and heat from the plasma into power that drives the rotating magnetic field (RMF) heating system. He produced a complete design and sized the system. He also wrote several MATLAB functions to analyze the system. Charlotte worked on the design of the superconducting coil support structure making good use of her Unified Engineering course skills! 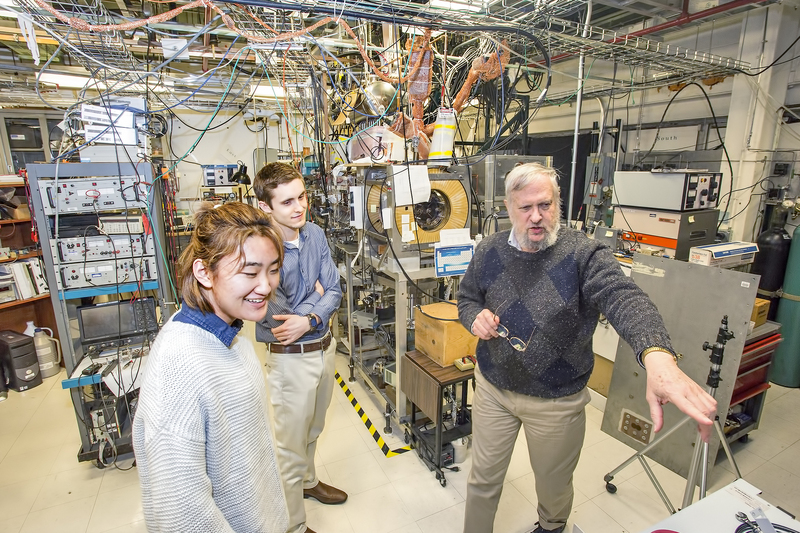 Here is a picture of Charlotte and Eric in front of the Princeton Field Reversed Configuration Model 2 test machine (PFRC-2) at the Princeton Plasma Physics Laboratory. Dr. Samuel Cohen, inventor of PFRC, is showing them the machine. Both Charlotte and Eric made important contributions to our project! We enjoyed having them at Princeton Satellite Systems and wish them the best of luck in their future endeavors! The spectacular success of the NASA New Horizons mission has led to many new discoveries about Pluto. The next step would be to send an orbiter. That isn’t easy to do with chemical propulsion but could be done with Direct Fusion Drive. We’ve done a preliminary mission analysis for a Pluto orbital mission. We are baselining a Delta IV Heavy that can put up to 9,306 kg into interplanetary orbits. These plots show various parameters versus mission duration. The maximum duration is the same as the New Horizons mission, 10 years. Once there, almost 2 MW of power would be available for the science mission, over 10000 times as much power as is available to New Horizons! The New Horizons bit rate is no more than 3000 bits per second. The high power would allow for a bit rate of over 135 Mbps for data transmission back to Earth using the JPL Deep Space Optical Communications System and a 30 kW laser transmitter. The time in transit is much shorter than New Horizons and would produce significant savings on operations costs. Launch times would be more flexible since gravity assists would not be needed. DFD would use deuterium and helium-3 as fuels. Only 1700 L of helium-3 would be needed for this project. Current U.S. production of helium-3 is about 8,000 L per year. Since we would be going all the way to Pluto it would make sense to include a lander. One way to power the lander is using laser power beamed from the orbiter. Here are results for a possible system, beaming over 30 Wh per pass from a 200 km orbital altitude. The next step is to build a slightly larger machine to demonstrate fusion. Fusion power generation has been demonstrated in the Princeton Plasma Physics Laboratory Tokamak Fusion Test Reactor and the Joint European Torus but never in a machine using helium-3. A flight engine would follow. Its small size would keep the development and production costs down. DFD would enable many challenging missions include human exploration of Mars, Europa landers and interstellar probes. Nuclear fusion power research started in earnest in the 1950’s. Initially, researchers thought that the work needed to produce a fusion power plant would be comparable to that needed to produce the first fission plants. That turned out to be unrealistic as the physics was not well understood and plasma confinement was much more difficult than expected. Many of the first machines were Stellarators. One of the first was Lyman Spitzer’s Stellarator at the Princeton Plasma Physics Laboratory (PPPL). Many machine geometries were tried such as mirrors and pinches. In the 1960’s the Soviets disclosed success with the Tokamak (тороидальная камера с аксиальным магнитным полем). Unlike the Stellarators, Tokamaks have a circulating current that helps confine the plasma. Since then Tokamaks have been the focus of fusion power research. The Princeton Plasma Physics Laboratory produced 10.7 MW of fusion power in 1994 in the Tokamak Fusion Test Reactor (TFTR). The Joint European Torus (JET) produced 22 MW of fusion power in 1997. In 1998 the Japanese JT-60 produced an equivalent power gain of 1.25, that is 1.25 MW of fusion power for 1 MW of input power. The next step in Tokamaks is the International Thermonuclear Experimental Reactor (ITER). ITER is a large-scale scientific experiment to demonstrate that it is possible to produce commercial energy from fusion. Its goal is to produce a fusion power gain of 10 at a power level of 500 MW and to generate this power for 500 seconds. Operation with tritium is scheduled to begin in 2027. The next step after ITER is DEMO which will be a prototype of a practical fusion power plant. Demo will produce between 2 and 4 GW of thermal power and have a power gain of 25. After DEMO the next machine will be PROTO which will be a fully commercial power plant. PROTO is expected to built after 2050. In parallel with ITER many other magnetic confinement devices are under test. These include the U.S. National Spherical Tokamak (NSTX) and the Princeton Field Reversed Configuration (on which DFD is based) both at PPPL. Many new Stellarators are under test including the Wendelstein 7-X in Germany, the Helically Symmetric eXperiment (HSX) in the U.S. and the Large Helical Device in Japan. These devices may result in more economical fusion machines than Tokamaks. The field of fusion researchis very vibrant and work around the world is serving to improve our knowledge of plasma physics and the help solve the engineering problems. For example, recently a new method for reducing instabilities was developed at JET. The first commercial reactors will likely use deuterium and lithium as fuels. The reaction (used in TFTR, JET and ITER) is deuterium and tritium but in a commercial plant the tritium would be produced from the neutron bombardment of lithium as the D-T reaction produces most of its energy in energetic neutrons. Advanced fuels like deuterium helium 3 and boron proton that produce fewer neutrons are also under investigation. Deuterium and helium 3 would power the DFD. 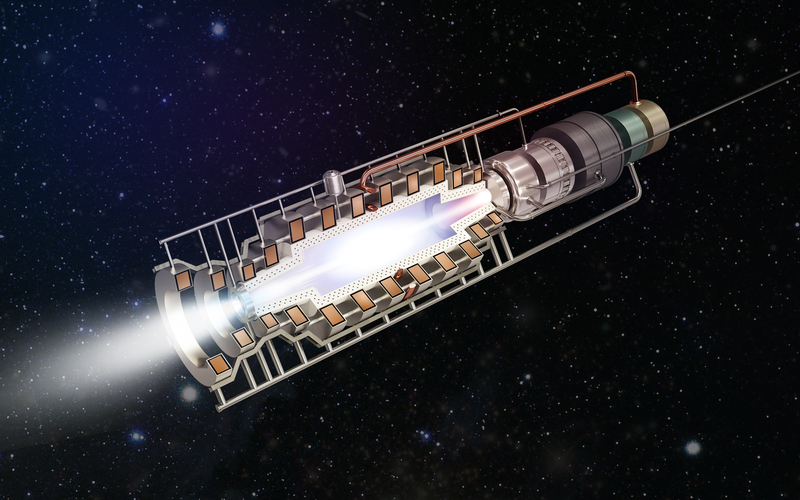 The boron-proton reaction would power TriAlpha’s reactor. Only two days after a visit by journalist Michael Lemonick, our DFD fusion drive was featured in his post on Time.com’s science section! The article does misstate that Sam Cohen is a PSS engineer, when in fact he is the lead researcher on the PFRC at Princeton Plasma Physics Lab (PPPL). The proposed NASA mission to the Jupiter Icy Moons was JIMO – Jupiter Icy Moon Orbiter Mission. JUICE JUpiter ICy moon Explorer is a European Space Agency mission. For more information on DFD, go to our fusion propulsion page. The habitat has a 500 day configuration, with more than enough room for all of the astronauts and their supplies! We will use the Orion spacecraft for transfer from Earth’s surface to Earth orbit, where it will dock with the DFD powered spacecraft. That is what the banner image is portraying! Once the astronauts are aboard the DFD powered spacecraft, they will travel to Mars and back in roughly 10 months, including a 1 month stay at Mars. After they have returned to Earth orbit, the spacecraft will dock with the Orion capsule. The crew can then safely return to Earth’s surface aboard the Orion! That is the number of people in the entire history of human civilization who have left Low Earth Orbit (LEO). You heard me right, only 24 people (all Apollo astronauts) have left the protection of Earth’s magnetic field. The prospects of journeying past LEO is a daunting one. There is dangerous radiation in deep space that the magnetic field protects us from. There are two types of radiation that pose a risk to astronauts: those that originate outside the solar system, the Galactic Cosmic Rays (GCR), and those that come from the sun, called Solar Proton Events (SPE). The GCR consist mainly of heavy atomic nuclei, while the SPE, as the name suggests, consists mostly of protons. Both of these types of radiation are high energy, so if they hit an unshielded astronaut they could cause damage to DNA, cell replication, and even lead to cell death. The SPE, released during solar flares and coronal mass ejections, are especially dangerous as they emit so much radiation that it could be fatal to an unprotected astronaut. Luckily SPEs are rare and none occurred during the Apollo missions. Most of the damage from radiation is from prolonged exposure to it, which increases an astronaut’s risk of developing problems such as cancer and cataracts. Radiation is not the only danger to astronauts on a deep space mission, though. On a long mission, such as our proposed 308 day DFD powered mission to Mars, the extended period in weightlessness can cause issues as well. Bones and muscles that normally have to deal with gravity suddenly do not have any load on them. For this reason astronaut’s bones and muscles (including the heart!) begin to atrophy and lose mass. The ones most affected are those that fight with gravity: the bones and muscles in the lower back and legs. Astronauts will need to exercise daily to minimize these losses, but even that will not be 100% effective. Similarly there will be radiation shielding on the spacecraft and a storm shelter for the SPE, but nothing is perfect. These are just some of the risks associated with a voyage to Mars. Despite the risks, I do not think we will have any problems finding volunteers to be number 25! You may have noticed that we have a new banner image of our Direct Fusion Drive (DFD) transfer vehicle with the Orion spacecraft. Evolved Configuration launcher which can launch up to 130 metric tons into low earth orbit! The first mission would be to orbit Mars for a few days and then return to Earth. The vehicle would remain in orbit around the Earth. The next SLS launch would bring up a second transfer stage with the lander. A third launch would bring up another Orion and the crew for the landing mission. The DFD transfer vehicles stay in low-earth orbit where they can be used for a variety of missions, such as deflecting asteroids or lunar missions. We are currently working on the mission design along with conceptual designs of the transfer vehicle and Mars lander. A key consideration in the mission plan is keeping the astronauts healthy so astronaut physiology is a key part of our research. are running two experiments that support DFD. One is PFRC-2, Princeton Field Reversed Configuration 2, which is testing the reactor core. Here you see the experiment in action! and MNX which is studying magnetic nozzles. We have two more test reactors planned, PFRC-3 and PFRC-4. The last will burn deuterium and helium-3 to produce fusion power. After that we will be ready to build a space version of the fusion propulsion system. Of course, this reactor could be used for terrestrial power generation. In future posts we’ll talk about sources of helium-3 and alternative fuels that could power this reactor. Gary and I attended the Princeton Plasma Physics Laboratory (PPPL) Inventors dinner at Prospect House on the Princeton University campus. Awards were given for 19 patents, patent applications and invention disclosures by PPPL engineers and scientists along with their co-inventors from other institutions. Gary and I are on a patent application with Sam Cohen of PPPL and Yosef Razin of PSS titled, “Method to Produce High Specific Impulse and Moderate Thrust from a Fusion-powered Rocket Engine: (ARE-Aneutronic Rocket Engine). This is the core technology for our Direct Fusion Drive (DFD). PSS has licensed this and one other fusion patents from Princeton University for DFD work. I gave a short speech talking about how DFD may take astronauts to Mars in the not too distant future for both orbital and landing missions. We handed out Mars candy bars and DFD bookmarks to the guests. The dinner was excellent and it was fun talking with our colleagues at PPPL! We look forward to next years dinner! Please join us at the Princeton Plasma Physics Laboratory from 9 am to 4 pm on June 1, 2013. We will have exhibits on our Direct Fusion Drive, a collaborative project with PPPL to develop a nuclear fusion rocket engine for space propulsion, and on our SunStations for home electrical power backup and electric vehicle charging.